At Mar‑Lin Dock & Door, we have been working with Garaga for many years. We have seen first-hand how their doors are a cut above the competition. We know there’s a perfect Garaga door for every residential, commercial and industrial project. Built in Canada, GARAGA garage doors are built for our harsh climate. All doors come with insulation and weather-stripping to help protect your home from wind, water and cold. Their high R-value makes them highly energy efficient. Garaga doors are built from a lightweight yet extremely strong composite material to make them durable. They are the most rugged garage door on the market. We have installed Garaga doors throughout the Leamington area, including Windsor, Chatham, Ridgetown, Kingsville, Essex, Tecumseh, LaSalle and Amherstburg. Customers often tell us they love their new Garaga door! Why are garaga doors the best? There are many reasons to choose a GARAGA garage door. Garaga is known as a leader in the garage door industry. They can’t be beat thanks to their warranties, manufacturing best practices and advanced technology. Garaga guarantees your new door’s panels against perforations due to rust. Their doors are built to last. Garaga doors are built to withstand many years of use. All of their doors are manufactured with quality materials including 14‑gauge galvanized steel tracks, steel rollers and welded anchoring plates. Their panels provide a higher insulation level than all others on the market. Garaga doors are as airtight as possible to keep your home safe from the elements. With Garaga, you can customize your door to match your home. They offer a choice of 17 different door colours, 14 different designs and many window and hardware options. Garaga blows away the competition when it comes to their workmanship. 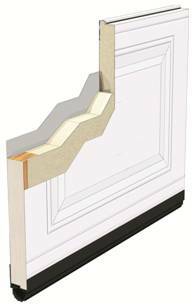 Each door is carefully constructed with only the best materials. Before shipping out the final product, every garage door is carefully inspected and tested to make sure it’s perfect. Their doors are so well built, Garaga isn’t afraid to stand behind their product – they offer some of the best warranties on the market. Did you know Garaga is a family-run business? Garaga was founded in 1983 by Michel Gendreau in Saint-Georges, Quebec, Canada. Today, their doors are still manufactured in Saint-Georges, as well as in Barrie, Ontario. GARAGA garage doors are now distributed throughout North America as well as some international markets. From one family-run business to another, we at Mar-Lin Dock & Door are proud to offer quality Canadian-made products. We continue to recommend GARAGA garage doors to all of our customers – we know quality when we see it!